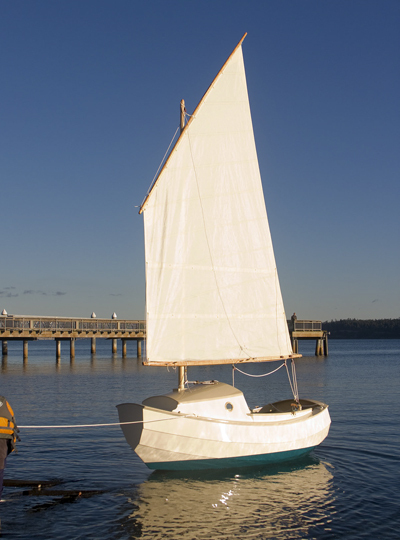 Our own youthful dreams often featured small boats in starring roles. Aboard these simple, stalwart little vessels we’d venture across nebulous bodies of water in search of distant wild shorelines or uncharted islands. We’d land, hike into the interior, and make camp. But always our boats offered refuge from any threat, including summer storms, which we’d wait out beneath our boom tents. At night we’d read sea stories by oil lantern and sleep under a blanket of stars. Curiously, never once did these visions include negative images of wrestling with a heavy mast and complex rigging, fussing with a smelly, recalcitrant outboard, or being held off shore by our boat’s draft. And even when we pictured the afternoon breeze kicking up whitecaps, never once did the vision include a chilly capsize. It was the dream of returning to those simple pleasures that inspired thoughts of SCAMP. That and a persistent desire to go over “there” —that place we often see but are unable to reach. It seems to happen on every cruise. Never mind that we’re usually sailing the smallest boat around for miles, we always come upon some ultra-shallow lagoon or serpentine tidal stream that disappears into the reeds, trees and rushes. To get in there—to really commune with nature—a boat needs to be light, shallow and easily propelled—and preferably flat-bottomed in case we decide to stay right though the ebb. 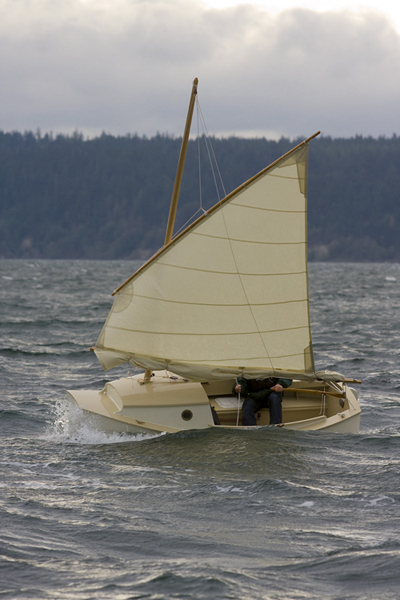 SCAMP features an offset centerboard, massive flotation from sealed seats and stowage cabin, a water ballast tank holding 173 pounds of water, an after cabin "veranda" that functions like a hard dodger, and a flat bottom and skegs for beaching. 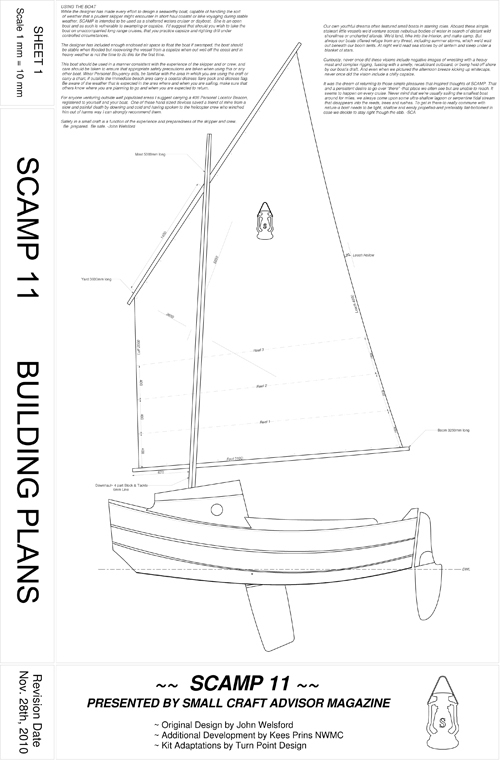 PLANS: Complete plans now available on 7 24 x 36" sheets. 100-page "Building guide" with suggested steps included as PDF. 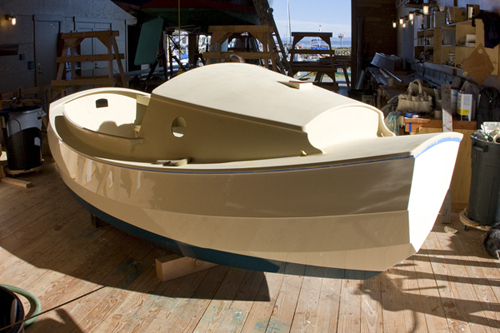 Dozens of boats now under construction and documenting progress at the Small Craft Advisor message board and elsewhere online. Water Balast - 173 lbs. Weight (including rig) - 420 lbs.